‘Maybe we’re just crazy’: How did a Maine town of 2,000 people become known as Pumpkinville, anyway? 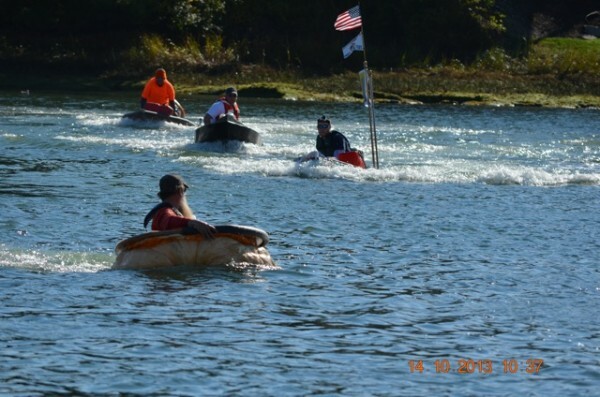 Racers get going Monday morning in the motor division of the annual Damariscotta Pumpkinfest & Regatta. Tom Lishness, a co-founder of the annual Damariscotta Pumpkinfest & Regatta, gets ready to race Monday morning. 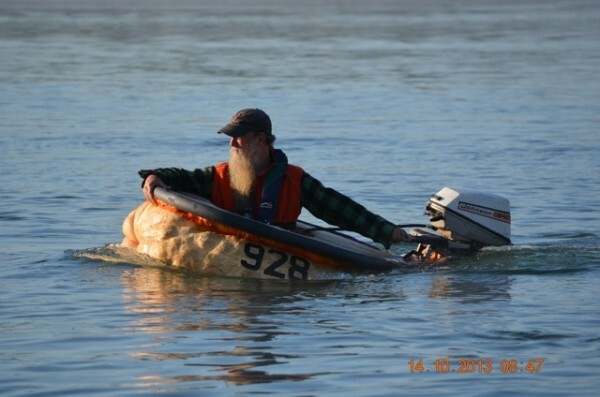 DAMARISCOTTA, Maine — Nine years ago, before the hoopla, television cameras and crowds of people came from all over to the shores of the Damariscotta River every October, there were just two men and one dream: to put an outboard motor on a giant pumpkin and ride in it. “It’s everybody’s dream, to ride the giant pumpkin,” Buzz Pinkham, one of those men, said Monday — tongue only slightly in cheek. That’s because the years have shown that if everybody doesn’t want to pilot the giant pumpkin boats, they certainly want to watch the captains crash into each other, sink or even safely make it back to the dock in the event that has turned into the annual Damariscotta Pumpkinfest and Regatta. Over the 10 or so days of the festival, now in its seventh year and winding down Monday, Pinkham, its self-described instigator, estimated that between 20,000 and 30,000 people swelled the streets of Damariscotta. They marveled at the massive pumpkins on Main Street painted and sculpted by local artists. They gasped during the pumpkin drop — during which a 1,050-pound pumpkin was winched 200 feet in the air with a crane and then let drop, with satisfactory results, onto a donated junked car far below. And, he said, they came to watch the regatta, which took place on Monday morning and included a relay race, pumpkin boats powered by paddles and the “super modified” division — with outboard motors, superstructures and a little extra flotation. That’s Pinkham’s speciality. Pinkham, 58, who owns Pinkham’s Plantation garden center and nursery, said that it all began nine years ago, when his buddy Bill Clark stopped by the greenhouse and expressed a wish that more people would grow giant pumpkins. Pinkham got to looking at a copy of “How to Grow Giant Pumpkins, Vol. 3,” and saw a photograph of someone in a pumpkin with an outboard motor on it. His imagination fired. That first year, the duo tried to sneak the 754-pound pumpkin boat to its launching site, but it’s hard to keep something that big under wraps, Pinkham said. Somehow, other people got it in their heads that they wanted to join him in the water. The first year that television cameras came to film the giant pumpkin boat races, the video clips often got categorized under “weird news.” But Pinkham said that doesn’t bother him one whit. This year, a production team from the national CBS Sunday Morning program came to do a segment that is scheduled to air on Oct. 27, he said. Correction: A photo cutline misspells the name of the co-founder of the annual Damariscotta Pumpkinfest & Regatta. It is Tom Lishness.